Joan West passed away January 18, 2011, with ovarian cancer. She fought this for 4 years. Alice is my mother who died of ovarian cancer on November 24, 2006. She had the symptoms mentioned, but her cancer had progressed. Thank you for what you do to raise awareness and funds for research. Our Mother, Elizabeth Kraiza, fought a courageous fight with ovarian cancer... twice. She was diagnosed twenty five years ago...a tumor the size of a grapefruit was removed, and after 6 months of chemo was assessed by her doctor as being cancer free. Last August 2010 she was diagnosed with returning ovarian cancer...and this time, at the age of 77, she just could not beat the demon...She is our hero. I have lost both my daughters to ovarian cancer. Heather was 17 when she died in 1994, and then her sister Jessica at age 27 in 2008. I miss them so much, my heart is empty! I love you my babies so much! My Grandma, Doris Baldwin, was one of the bravest women I've ever known. 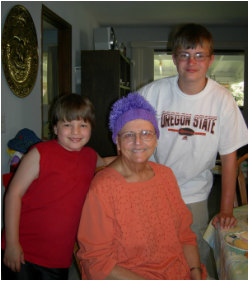 In early 2008, at the age of 66, my Grandma was diagnosed with stage IIIC ovarian cancer. We took my Grandma to the Empowerment Walk, and everyone was so kind and welcoming to her. My Grandma was not one to complain, not even at the end of her life. 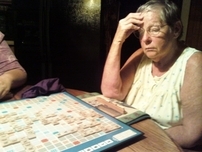 Grandma died right before Christmas 2011. She handled herself with such dignity, and I truly hope that a cure will be found for this disease. I hope that I can help in someway. My Grandma was an amazing woman who is dearly missed. On Sunday, March 22, 2009, my Mom, Donna Lee Nutting Bertell, passed away after a 17-month battle with Ovarian Cancer. She is loved and missed each and every day...and will live in our hearts forever. Beautiful all of her life. Best Mom and Best Friend ever! 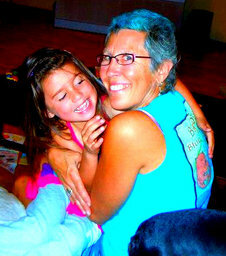 My mom, Muriel McEwen, was diagnosed with ovarian cancer in February 2009, and passed away just 9 months later! Mom didn't have any symptoms, but a doctor noticed something during a routine colonoscopy, she was already at stage 4! She had a hysterectomy, and a couple couple rounds of chemo, but the tumors returned attacking her liver! This is a quiet cancer that needs to be silenced! She is so missed by her family, and friends! On Sunday, June 23, 2013, Heaven gained another angel. Carrie was adored by all that she encountered and had such a cheerful impact on everyone in her life. Whether she was playing her resilient role as a wonderful mother to her children, caring for her parents or buying the next round of drinks and dancing with her friends, Carrie always kept a positive attitude and charmed the pants off of everyone around her. It's only been two weeks since she's been gone and we miss her like crazy; more than words can describe. We can only hope that enough support is given to find a cure for this dreadful illness so we can keep wonderful people like my mother down here on earth.